If you are not reading Night of the Living Deadpool, a mini-series by Marvel Comics, then I highly suggest that you start immediately, so that you won’t miss out on a fun, horror comic. The series began with Deadpool waking up from an all-you-can-eat chimicanga induced coma. Having no idea as to why the city was deserted, he eventually discovers that he slept through a talking zombie apocalypse. Their consciousness is alive, but they can’t control their bodies, or the killings. Some of them even begged Deadpool to kill them. Just as the zombies were closing in on the merc with the mouth, who finds humor amidst all the chaos, a small group of survivors rolled up in an El Camino, driven by an older, feisty woman, called granma by the kid survivors. In the current issue, Deadpool and his rescuers blasts their way out of safety. The apocalypse is worldwide, so their lives remain in danger. Eventually becoming the sole survivor of the Deadpool scouts (yeah, that’s what he called them), Deadpool discovers a barricaded, but safe, community in West Virginia. Surveying the community from a distance, Deadpool is approached by a group of women, both young and old. One of the women tells Deadpool that they’re travelers, who came a long way to find the community, after hearing rumors of its’ purity. The women all APPEAR to be nice and friendly. BUT ARE THEY? Cullen Bunn is the writer of this entertaining script. The talking zombies are a major plus. I laughed when the El Camino rolled up, I haven’t seen one of those in years. There was a cut on Deadpool’s arm, but the wound healed itself. Readers now have to wait for the next issue to see if he turns into a zombie. Great artwork by Ramon Rosanas. I especially like how the art is in black-and-white, giving that eerie feeling that is expected in a horror story. 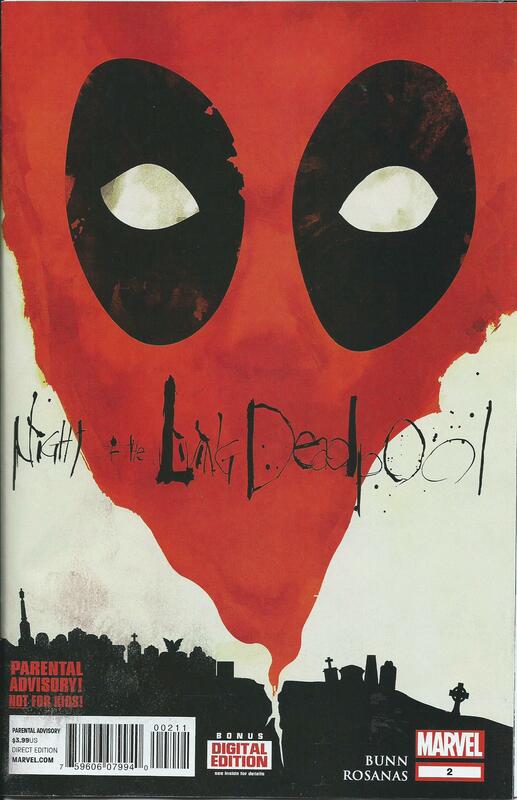 Deadpool is very easy to find, because he’s the only one that’s in color. There is no doubt that I plan to read this title until the end. I strongly recommend this Mini-series, by Marvel comics, for Deadpool and horror fans. Amazing script plus amazing art equals 5/5 stars.